Saturday July 10th the Independence headed to the ARUNDO. This large freighter was torpedoed in WWII while carrying war supplies to Africa. She now lies 16 miles out of Manasquan inlet in 130 fsw. The forecast for the weekend was iffy but we decided to give it a go. We were immediately glad we did as the seas were gentle rollers making a smooth ride out. On the bottom the temp was about 45F with 15 feet of visibility. It was surprisingly bright with lots of ambient light despite the slightly overcast skies above. We were tied in just forward of the boilers. 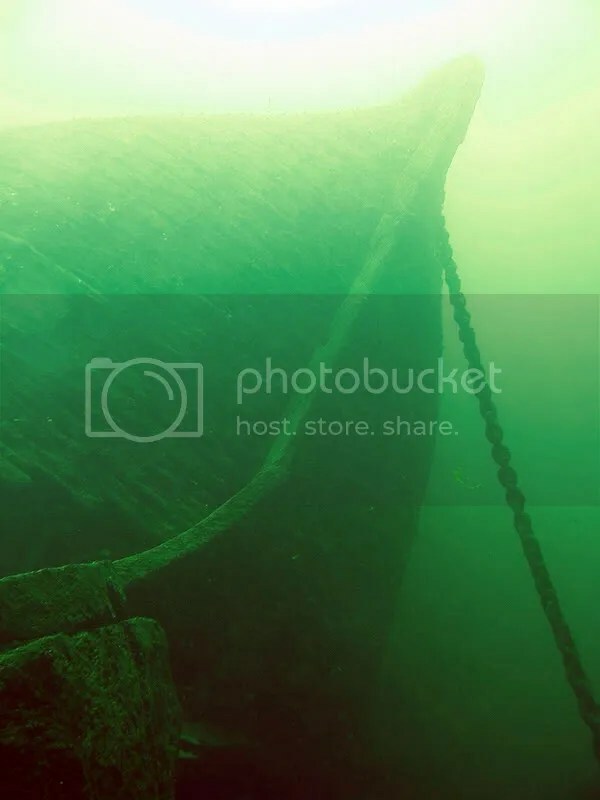 I opted to leave the camera on board and explore the wreck since I have only been here a couple times before. I had a nice swim to the stern where I found the prop. I spent a good amount of time swimming with my light off just enjoying the solemn ambiance of the dimly lit landscape of trucks and truck parts that are a reminder of days of war close to our shores. After a nice sushi dinner and a trip to the boardwalk for some waffles and ice cream it was time to hit the bunk for an early morning departure to the “56 mile wreck”. This is a large steel wreck in 180 fsw waiting to be identified. It is also known locally as the “Herbert Parker”. Despite numerous tries this would be my first time making it out to this offshore wreck. There were some large swells but they were pretty far apart so we were able to make good time out to the wreck. Bill Trent and I splashed with the shot line to tie in and hit the bottom just off the wreck near the boilers and some large structure. It was a chilly 41 F and the visibility was good, not great (for offshore), at about 30 feet. 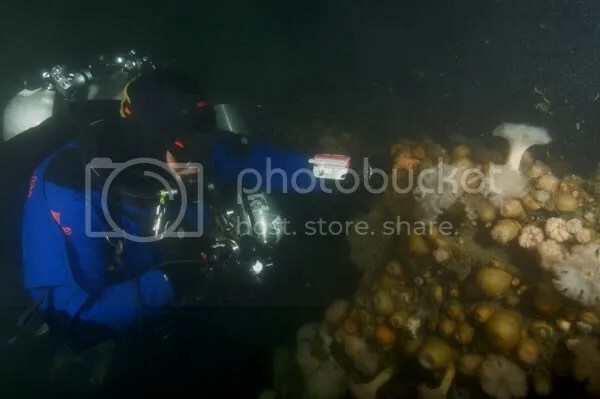 I had to keep reminding myself that I wanted to actually check out the wreck and to leave the dinner plate sized scallops covering the bottom alone. There were several derelict scallop dredges on the wreck indicating the presence of these tasty bi-valves is no secret here. 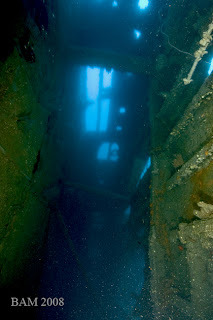 There were schools of huge cod swimming about and I got to see a good portion of the wreck which is huge. I would have liked to see more, but my dry glove leaking and seeping up my arm caused me to cut my bottom time at 30 minutes before I completely froze. I did finally relent to my stomach and took the last 2 minutes of my bottom time to fill half my goodie bag with scallops. As I ascended I kept my eyes locked to the temperature reading on my X1 waiting for warmer water and it wasn’t until 50 feet that the thermocline provided some reprieve for my now numb hand/arm. It regained feeling quickly though in the 74 degree water and the remainder of deco was pleasant even though I was quite soggy. Everyone bagged up on scallops and a few lobsters came up. 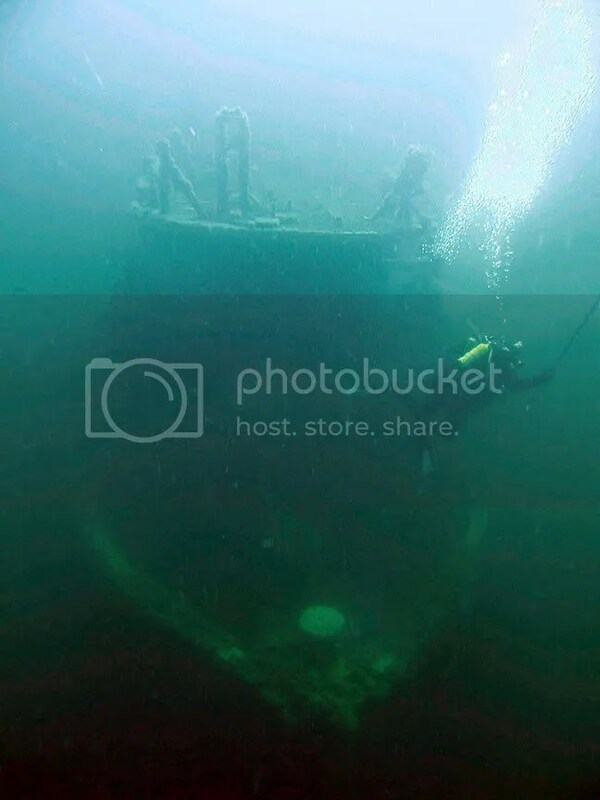 Most did 2 dives to get the most of a nice day offshore on this great wreck. I opted to enjoy the weather a nice scallop sashimi lunch. Return trips will be definitely be planned to try and find clues to the identity of this big wreck. Sea turtles must be mating or something because we spent the ride home dodging the buggers. I spent a lot of gas and a lot of time and effort trying to locate this wreck yesterday but to no avail. the GPS numbers from my chart were not accurate. Any chance you could email me confirmed numbers? I was hoping to fish for cod there. It was the 56 mile or Herb Parker Wreck I was searching for, not the Arundo.